As everyone focuses their basketball attention towards the great NBA Finals series going on right now, the 2015 Draft is less than two weeks away. Here is my first Mock Draft. I did not include fake trades for this one, but will mention which teams I think will end up trading in the description after each pick. Next Mock Draft I do will be the fan operated one. I will be conducting it through my Facebook where each team’s pick is chosen by a different person. Stay tuned for more information on that if your interested. As much as I’m hearing Flip Saunders currently prefers Jahlil Okafor the rest of the T-Wolves management continues to be all in on Towns. Towns will be the first overall pick, and I do not believe the rumors that Minnesota will trade the top pick. Towns fits too perfectly on this young team to pass up. This could be where the draft gets interesting, even though ultimately I think the Lakers select Okafor. However, I do not think Okafor and Randle can play together on the same front court of a championship team (lack of defense/shot blocking). I think the Lakers should take D’Angelo Russell and let him learn from Kobe Bryant, but I think the Lakers ultimately take who the front office likes and that’s Okafor. So the Sixers will probably be sitting here with their choice of point guard. I could totally see them trading down with the Knicks to let them take Russell so they get Mudiay at No. 4 anyway. Reports today said Russell did not go workout for the team, but that’s not why I think Philly takes Mudiay. Russell is more NBA-ready, and the Sixers do not want to be good yet. Mudiay might be the better player 3 years from now and that’s exactly what the Sixers are looking for. There is talks of the Knicks trading back to take point guard Cam Payne later in the lottery, but if Russell falls to them at No. 4 I guarantee they stay put and take him. Russell would be great on the Knicks next to Carmelo Anthony and it would be a no-brianer pick. I really like this kid, and think he would be a perfect piece for the Magic to add to their really young core of players. He is a great shooter for his size (6’11”). The only knock is that he doesn’t have an NBA body yet. That is something that can be fixed and when it is watch out. From the first minute of tape I watched of Porzingas shooting, I noticed his feet/landing on jump shots reminds me of Dirk. That can never be a bad sign. Cauley-Stein is being tabbed as potentially the best defender in this draft. If the Kings pass on him here he might slide a little. Good news is I think the Kings management, which is a mess in case you haven’t noticed, will take Cauley-Stein in an attmept to please their superstar DeMarcus Cousins. Boogie is on record saying he wants to play next to Cauley-Stein so this messed up management might just do what Cousins says. Not a bad pick, but it’s no secret Cauley-Stein has no offensive game at this point. One would hope that’s something that could be developed. The Kings big need is point guard, so I wouldn’t be surprised if they try to move up to get Mudiay. Mudiay might fall to them here, which would be the best case scenario. Denver is going to have a lot of needs in less than one season when Ty Lawson, Kenneth Faried, Danilo Gallinari and Wilson Chandler are all probably gone. The Nuggets have to be thinking who can we add to Jusuf Nurkic to build around. It’s really between Winslow and Mario Hezonja who I really like. I think the Nuggets will be thinking long term and will chose Winslow. The Pistons big need is an athletic wing and it’s really between Winslow, Stanley Johnson and Mario Hezonja. I think the Pistons are too much focused on winning sooner rather than later so they take the player they know more about in Johnson. Johnson also knows Reggie Jackson and Andre Drummond and keeping Drummond happy as contract discussions approach is an added bonus. Charlotte’s big need is shooting and I know a lot of people like them to take Devin Booker here. If Hezonja falls I think they will have no choice but to take him. He is an athletic player who can really shoot it. He would fit in perfectly and would be a great value pick here at No. 9. The Heat could really use another wing to play next to Dwayne Wade and Goran Dragic, but at this point in the draft it would be a reach to take one. Kelly Oubre is a really possibility here based on need, but if Miami takes the best player available it would be Turner. Payne has been moving up draft boards and I wouldn’t be surprised if he ends up going in the top ten somehow. I watched him at Murray State and know he can be a solid pro in the NBA. I just hope teams aren’t getting too caught up in the hype. It really is all about each draftee finding the right team and situation. The Jazz are in a great spot at No. 12. They can truly draft the best player available. Their starting lineup of Dante Exum, Alec Burks, Gordon Hayward, Derrick Favors and the Stifle Tower is very talented and young. They also have Rodney Hood who played well at the end of last season, so it makes sense for them to look for a versatile big man and Lyles fits that bill. I am very interested to see where Frank the Tank goes and how he does in the league. I think Phoenix would be a great fit with how fast they play. Their system would fit into his ability to stretch the floor. Oubre is really talented, but has had teams question his maturity and work ethic. Those are two things that you don’t want attached to your name as a draft prospect. He might fall even farther than this, even though he has top ten talent. I think he would be a good fit in OKC. Going to a stable team that has multiple veteran-presences in the locker room could really allow Oubre to succeed. Hawks are going to expect to bring back Paul Millsap and DeMarre Carroll so they too will be drafting the best player available. Portis is a big body with a great motor who can really rebound. Sounds like the perfect energy guy to have on the bench of a team contending for a championship. The Celtics are going to move up and probably won’t have this pick. If they do, Dekker makes the most sense. As I said this is the one team I fully expect to package their two first round picks to move up and grab a player they really like. I have Booker sliding in my mock draft, not because I don’t like his game, but because of the teams picking. If he gets past Charlotte at No. 9 who really needs shooting OKC may grab him at No. 14. I think whatever team he goes to he will be able to contribute and hit shots. I know the Rockets biggest need is point guard, but I don’t like Tyus Jones more than say Jerian Grant or Delon Wright. All of the rumors point to the Rockets taking Jones, though. The Wizards are in need of a power forward, and will be happy if Looney, Portis or Lyles fall to them. If all three are off the board I could see them trying to move back or selecting a dynamic bench scorer (Rashad Vaughn) or back up point guard (Grant/Wright). I like this kid. Good size and can really score. Might even go higher than this when the real draft comes around. If he gets past Toronto who may go backup point guard Dallas would be happy to draft Vaughn. One of the more experienced players in the draft and that’s exactly what you want out of a point guard. Grant probably should go ahead of Jones, but if he falls he would be a good fit on a contending team like Dallas or Chicago. We all go to see what Wright can do in the NCAA Tournament at the Utes made a run to the Sweet 16. He has great size (6’6″) and is another NBA-ready player from day one. 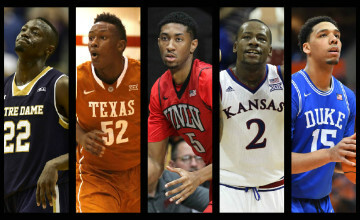 The Blazers will be drafting a wing as they have a lot of question marks as they look ahead to next season. They would be happy to draft Vaughn if he falls this far, but I don’t think he does. Hunter is a good pick this late in the first round. He can really shoot it and has NBA size. The Cavs would be thrilled with either Anderson or Rondae Hollis-Jefferson. They need a young, athletic wing who can shoot and both fit the bill. I chose Anderson because he is the better shooter of the two, while Hollis-Jefferson is probably the more athletic and better defender. Memphis needs shooting (where have I heard that before). They would be happy with either Hollis-Jefferson or Anderson, just as Cleveland would. If both are off the board by the time they pick they might decide to go with a big man considering Marc Gasol, Zach Randolph and Kosta Koufos could all be leaving. At this point teams are looking for value picks and McCullough is the perfect prospect. He’s athletic and versatile, something the Spurs have liked over the past few seasons. He definitely has first round talent and the Spurs would be happy if he’s here at No. 26. The Lakers need scoring and that’s what Young brings from a fast paced Duck team. If Young is not still available they may look to draft another big man to come off the bench behind Okafor and Randle. Backup guard is also a need they may try to fill late in the first round. The Celtics probably won’t have this pick when it comes on the clock on draft night. Whoever is selecting here will be deciding between athletic big man. Montrezl Harrell is intriguing. I can hope Harrell falls to my Nets here at No. 29. I do like Terry Rozier and Jarell Martin as well. The Nets are a mess and will be drafting the best player left. Unfortunately there may not be many left who can contribute from day one. This was the hardest pick to predict. The Warriors seem to have it all, even a pretty complete bench. David Lee might be traded this offseason to free up some cap space, so adding an athletic big can never hurt. This entry was posted in Draft / Offseason, Home, NBA and tagged 2015 NBA Draft, 2015 NBA Mock Draft, Cam Payne, D'Angelo Russell, Emmanuel Mudiay, First round picks, Frank Kaminsky, Jahlil Okafor, Joey Zocco, Justise Winslow, Karl-Anthony Towns, Kristaps Porzingas, Los Angeles Lakers, Lottery Picks, Mario Hezonja, Minnesota Timberwolves, Myles Turner, NBA Mock Draft, New York Knicks, Philadelphia 76ers, Stanley Johnson, Tyus Jones, Willie-Cauley Stein, ZML. Bookmark the permalink.